Phil Mickelson ran into trouble on the second day of the Scottish Open in Loch Lomond and blew his chance to depose Tiger as golf’s number one for at least another week. He came to grief on the 455 yard, Par-4, 18th hole, his 9th on the day, which has water all the way down the left hand side. His first drive went into the water and it seemed that his second had fared little better, so he changed his driver for a 3-wood and played a third ball, his fifth stroke, out to the right to ensure that it remained in play. 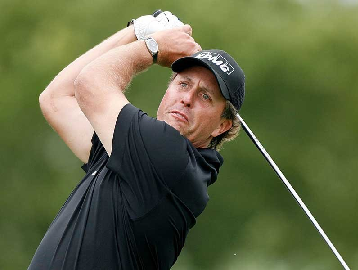 In fact, as he walked down the fairway the TV commentator and previous Scottish Open winner, Wayne Riley, told Mickelson that his second ball was playable, but quite rightly the left-hander said that he had not declared his third ball to be a provisional and under the rules of golf had to play it. If he had played his second ball he would have incurred two more penalty strokes for playing a wrong ball as it was no longer in play. Presumably Phil knew that because he was virtually certain that both his first two balls were in the water hazard he did not have the option of playing a provisional ball (see my April blog on this subject here). "I didn't want to walk 300 yards up and 300 yards back." I sympathise with Phil’s predicament here. Because there was water all the way down the left hand side and he had started the ball out over the water, his only options were to play again from the teeing ground or walk all the way to where his ball may have landed in the water hazard in the hope that it might be playable, knowing that he would have to walk all the way back to the tee if it wasn’t. No Phil, you incurred only two penalty strokes on that hole; 1st in the water hazard, 2nd one penalty stroke, 3rd in the water hazard, 4th one penalty stroke, 5th down the right and four more to hole out, making seven strokes and two penalty strokes for a quintuple bogey on the par-4. As a high handicapper, am I mean to find it strangely satisfying that even Phil, currently ranked as the second best player in the world, can sometimes have a 9 on his card? The only consolation for him is that he will almost certainly miss the cut in Loch Lomond, which means that he will have an extra two days practice for the Open Championship at St. Andrews next week. Author of the book, ‘999 Questions on the Rules of Golf’. Click here for more information and 27 sample questions/answers taken from the book.